Last night I visited the Casa de los Mejía Godoy for the first time. This is a restaurant/bar in Managua owned and operated by the hermanos Mejía Godoy, and serves as a center for cultural life, with the brothers and different invitados playing music on a regular basis. Carlos Mejía Godoy has been referred to as the "father" of Nicaraguan folk music, and was at the cultural heart of the Sandinista Revolution. Last night, we got to see the Orchesta Juvenil Nicaragua play everything from Beethoven to Nicaraguan folk songs; the cellos in the front row reminded me of my dear neighbor, Mason Dille, cellist extraordinaire! It's so great to hear that there are amazing people and organizations like that all over world...it gives me hope that Dudamel can inspire a similar movement here in Los Angeles! 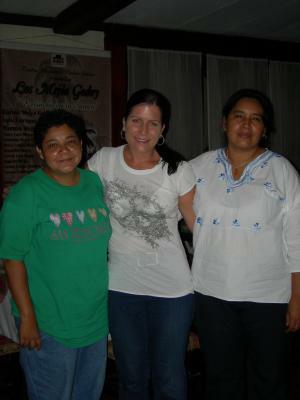 Forgot to mention that in this picture with me are my dear friends from Accion Medica, Claudia (to my right) and Yamileth (to my left).